Clean the kitchen and make it spotless on the morning of Dae-pa Adar Ruz i.e. the day before the birthday of the Fire. On Dae-pa Adar Ruz – Uzirin Gah after lunch, clean the kitchen with a clean cloth again. First heat the coals until they are glowing, and put the burning embers in the Afarganyu, and keep the fire burning by putting small kathis (logs of wood) and sandal wood. * Sprinkle water round the stove (choola) and wipe with a clean wet cloth. Then put chalk patterns made with powdered lime, round the stove or fire place, making 7 or 9 designs. Then put a tili i.e. mark the stove or fire place on the wall behind with the kum-kum paste, making a mark (similar to the rays of the sun). Also draw a fire in an afarganyu, a chippyo (tong) and a flat chamach (ladle) and then draw a small square with a diagonal cross as shown below. Some people also draw a farohar on the wall. These are symbols of the fire service i.e. boi ceremony and the square with diagonals is an ancient Iranian symbol found on a 7th century ossuary in Sabz Shavar in Central Asia. * Place a vase of flowers near the Afarganyu. * Put a small beaker of water in the ses. * You can also put small beakers of milk and wine. * And special food such a papri, malido/ravo, sev, etc. * Then fill the afarganyu with more coals and wood and keep it burning. Leave sukhur and loban near it so that every hour you can feed the fire and keep it going. It does not have to have flames; it can be just burning embers. The fire should be kept burning until the following morning. * In a tray (khumcho) put fruits and mithai and loose flowers. * Put a full ses containing a soparo, gulabdan, kum-kum holder, silver fish and grains of dry rice, sakkar (sugar crystals), rose water in the gulabdan and a divo near it. * At 3.45 p.m. in the afternoon take a bath, do your kusti, light the divo, give sukhur and loban to the fire in the afarganyu. * Place a tray with fruits, mithai and loose flowers near the afarganyu. * On the other side of the stove put the ses with a few flowers and the divo, coconut and food such as papri, malido and halwa. * Do your kusti, recite Srosh Baj, the Gah Prayers, Ardibehesht Yasht and Atash Niyaish and any other prayer you may wish to recite. After reciting the prayers, offer sukhur and loban to the fire and shut the kitchen door. However, family members enter the kitchen at regular intervals to keep the Fire in the afarganyu burning and they enter at night to recite their evening prayers before going to sleep. In the old days, the women of the house would stay awake at night in order to ensure that the fire was kept burning. The door otherwise is kept shut till the next morning i.e. till Havan Gah of Adar Ruz, Adar Mah when the kitchen is re-opened. It is believed that Ardibehesht Ameshaspand and the Yazata Adar visit the fire to bless the house and its family members at night. 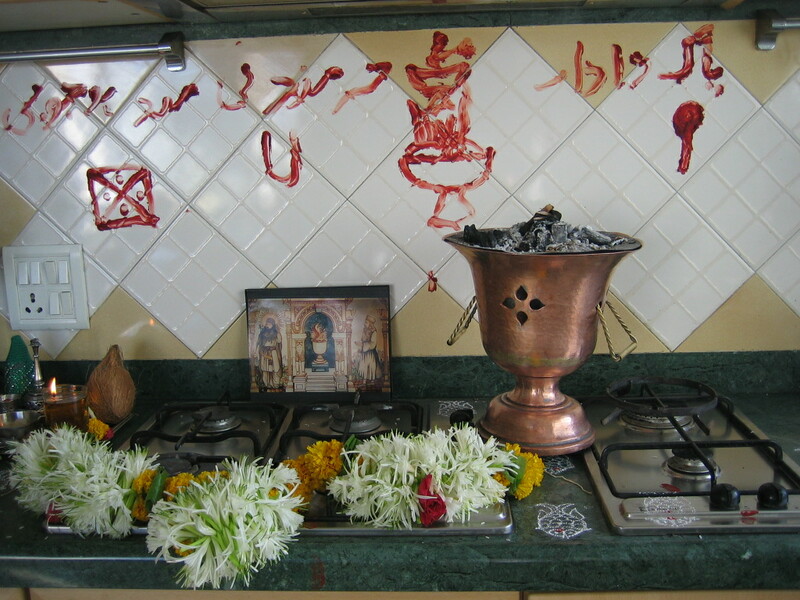 Please note nothing is cooked on the stove and the kitchen is not used, from Uzirin Gah on Dae-pa Adar Ruz, to Havan Gah of Adar Ruz. The stove is rested, and the family keeps the kitchen closed, and they have dinner in a restaurant or eat cold food. The stove has a garland, so does the ses, the kitchen door and the front door. The next day on Adar Ruz, Adar Mah, the stove is used to make tea or warm up milk and then it is used for cooking. The Divo is allowed to burn and the fruits and food blessed by Ardibehesht Ameshaspand are eaten at breakfast on Adar Ruz. Thank you very much for such a descriptive writeup. Now we know the correct way of performing this ceremony. Thank you so much for this very informative article. I read it very late but can always follow it nest year. Thank you once again. Please enlighten me for Meher Mahino Meher Roj also and its relevance for Aslaji Firetemple. Thank you Firoza! Appreciate the indepth explaination. Excellent post, very educative. I have circulated this to all Zoroastrians in Bahrain, where i m based. Thanks so much for this, really informative…. I am carrying out this ceremony as I now have the confidence after reading this wonderful article.Thank you so much!! Thank you very much for the indepth explaination. It is indeed very informative. I’ve studied in a Parsi school but was unfamiliar with this festivity. Only 1 question , why is it celebrated? In whose honour? Or is it simply for good year, good luck and prosperity? Thank u dear for sharing such important information. Will pass on to my friends.